There’s a battle brewing between two provinces in Canada over a pipeline, and it may cause transportation fuels prices to spike at least in the short-term. Here we offer the backstory to get you up-to-date. 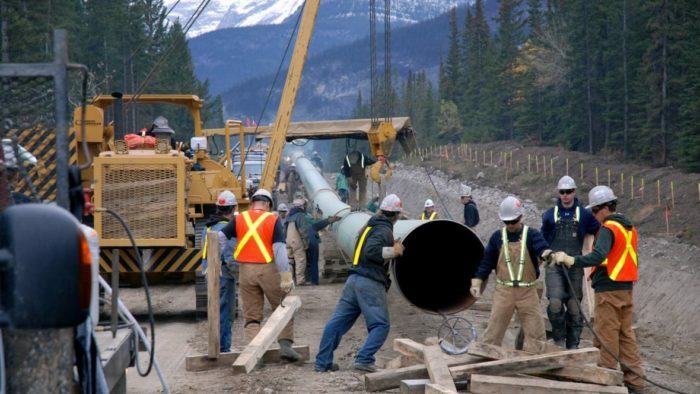 In 2013, Kinder Morgan filed an application with the Canadian National Energy Board to essentially twin the existing 1,150 km Trans Mountain pipeline from northern Alberta to the coast of British Columbia. This Trans Mountain Expansion would transport diluted bitumen and other products, increasing the Trans Mountain capacity from 300,000 barrels a day to 890,000. At a price of $7.4 billion, the expansion project had the support of many large petroleum industry actors including BP Canada, Tesoro, and Suncor. The project was approved by Canada’s federal cabinet in 2016, though it was subject to 157 binding conditions. In response to BC’s opposition, the Alberta government has threatened to introduce legislation granting itself the right to approve what gets shipped through the existing pipeline, potentially keeping the pipe filled with bitumen and forcing other products (such as gasoline) to find an alternate, more costly way to market. This tactic may seem extreme, but Alberta’s energy minister, Marg McCuaig-Boyd, has given her assurance that the threat to turn off oil shipments to BC is no bluff. McCuaig-Boyd told the Tornoto Sun: “This isn’t just talk. BC keeps throwing up roadblocks in front of us. This isn’t a bluff. We’re absolutely prepared to use it, should we need to use it.” Certainly, this move would result in fuel price increases in BC, particularly in the lower mainland near Vancouver, which presumably is intended to apply political pressure on the BC government to capitulate. Some see this as a risky tactic which could have the opposite effect on public sentiment for the project. Beyond the political impacts, this legislation would likely affect producers, refiners, and consumers across the west coast of North America. Pacific Northwest refiners may need to change crude sourcing and shift product placements which could impact pump prices in that region. Alternately, if more crude came down the pipeline to the Pacific Northwest from Canada instead of products, crude sourcing alternatives for the Pacific Northwest and California would improve. The more likely result is that less product would come into BC from Alberta, requiring increased supply from the Pacific Northwest, thus tightening up California products markets. Some Albertan companies will benefit due to additional pipe shipment of bitumen to tidewater. In many instances, however, products would ship by rail, resulting in the loss of product shipments on the pipeline. This shift in product movement would advantage crude producers over refiners. Prime Minister Justin Trudeau has said, “the Trans Mountain expansion is a vital strategic interest to Canada – it will be built.” Both the Albertan and federal government have also stated they will take a stake in the pipeline if necessary. However, positions are so entrenched it’s difficult to predict the outcome for the project. Stillwater Associates is tracking this development closely as it will undoubtedly affect our clients.